Mario doesn't just murder his enemies by stomping their skulls, he also turns them into musical instruments. 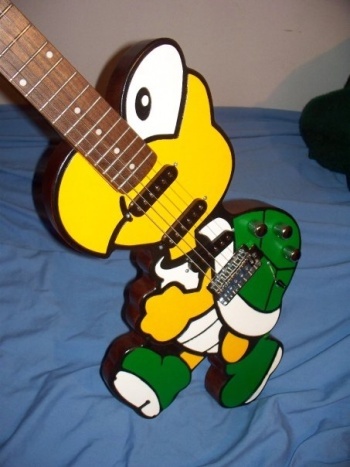 A poster on Reddit recently decided to show off his friend's hand-crafted Koopa Troopa shaped guitar. As you can see, this thing is no joke, and he's got the pictures to prove it. I would gander that its creator, only known on Reddit as SpatulaMaster, could sell this thing for a pretty penny if he chose to. God forbid that a reader of this site doesn't know what a Koopa Troopa is, but just in case, it's one of Mario's most iconic enemies. Along with the Goomba, you'd be hard pressed not to find one in every Mario game. SpatulaMaster may also have plans to turn an amp into a question mark block, an idea which I can't even handle due to awesomeness. He wrote in the Reddit comments that he could be convinced to custom build one of these axes for somebody, if he/she paid him enough and was patient. Seems like a match made in dead turtle heaven to me!